Technically, it’s already my birthday, but no one else is up to know, so I’ve marked it with a midnight snack, some Netflix (the new She-Ra and the first Galentine’s Day episode from Parks & Recreation), and some knitting while listening to my audiobook of the moment, The Woman Who Smashed Codes, about Elizabeth Smith Friedman, who was the chief codebreaker in America in the U.S. leading up to and during World War II and who was then forgotten for more than half a century while her husband’s success (also as a renowned codebreaker) was lauded. The shawl continues. It is optimistic, but not overly so, to think it could be done by next week, but six years of languishing on the needles certainly would not inspire anyone to place money on its completion. Certainly these three books will likely be done by then. Akata Witch is set in Nigeria and its young albino protagonist has recently discovered that she has magical powers. Insomnia is a series of musings about being awake overnight and touching on how while the condition is equated with a lack of sleep, it can also be full of creativity and thought and should perhaps be more celebrated than it is (but, also, she’s really tired). And Gmorning, Gnight! is a selection of Lin-Manuel Miranda’s pithy Twitter salutations illustrated by Johnny Sun. Much like short stories, I don’t have a lot of patience for either of these slender books when read at length, but enjoy them greatly when read for 10 pages or so at a time. I have a bunch of other books I’d like to get to soon, including Angie Thomas’ sophomore novel, On the Come Up, and am looking forward to procuring Jasper Fforde’s new novel, Early Riser, at his booksigning on Monday. But in the meantime, these three books and my audiobook will do just fine. 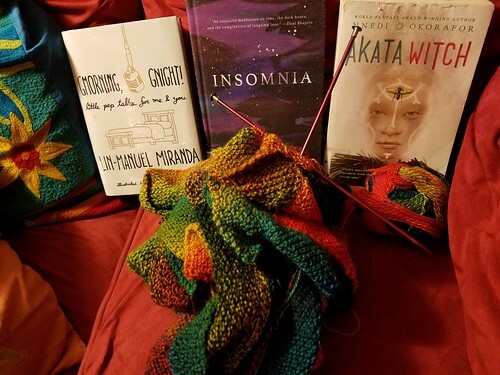 Head over to As Kat Knits to see what other people are reading and crafting. Happy Birthday! I like that you are having your own little celebration when no one else is even around to know. Have a wonderful day and a wonderful birthday week! Happy Birthday to you!! May this be the start of the most amazing year ever!